Regulations passed in 1990 with the Americans with Disabilities Act require all businesses to have ADA compliant Wayfinding signs. According to the ADA, all organizations open to the public must provide equal access to the disabled. This regulation includes businesses such as restaurants, stores, and theaters as well as public access buildings, like libraries. Installing ADA compliant wayfinding signs is necessary for a business to get their Certificate of Occupancy. Many companies don’t think about ADA signs until faced with a violation, yet they should. ADA compliant signs allow businesses to serve all clients regardless of ability. This accommodation is noble and serves the greater good. What does it mean to have ADA Compliant Signs? ADA compliance involves several factors. The height and placement of the wayfinding sign. Use of Braille or tactile letters. Easy to read colors and fonts. Do All Signs Need to be ADA Compliant? Not all business signs must comply with ADA regulations. Exterior signs remain exempt, as well as pylon signs. The types of signage that require compliance are mostly interior signs. According to the guide on the ADA website, wayfinding signs should meet the following regulations. Signs should be high-contrast – light on dark, or dark on light. Large fonts without decoration to make them easier to read. All Braille and tactile lettering must follow guidelines regarding character size and spacing. 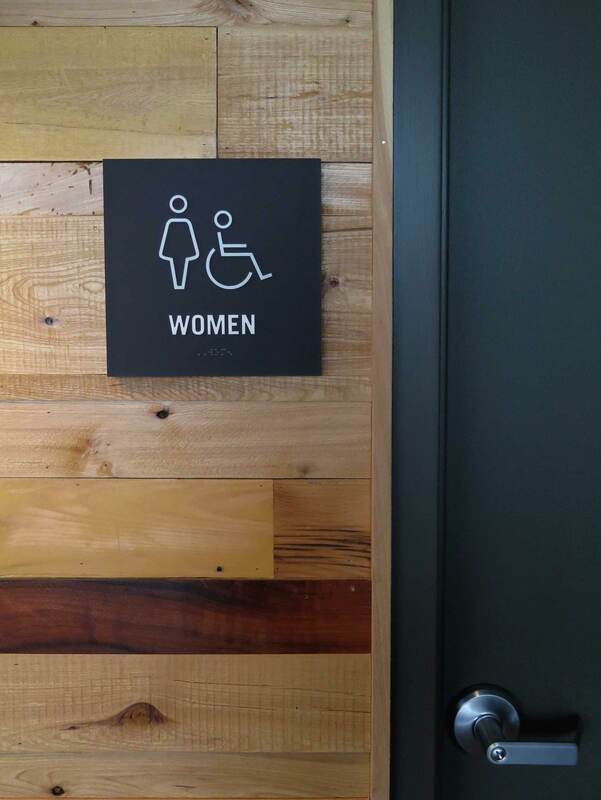 Bathroom signs and Entrance signs must be placed next to the door. International Symbol of Access Signs cannot deviate from the official symbol. This rule would include signs such as the one put on accessible parking spaces. However, just because a sign must meet these requirements does not mean that it can’t have artistic elements. 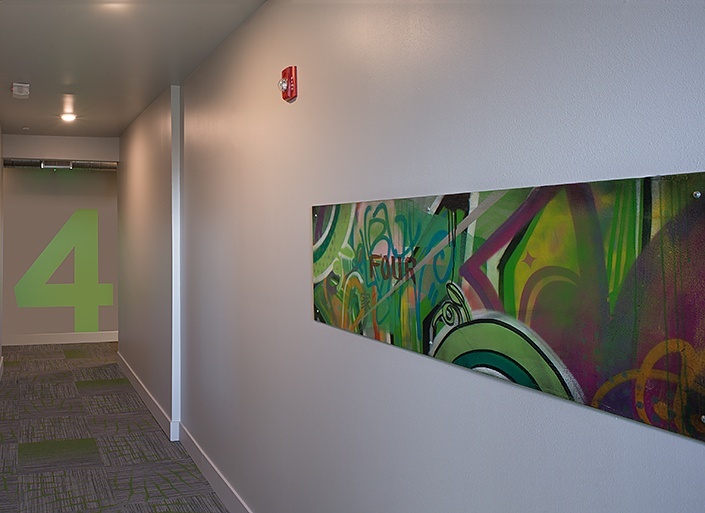 “Beyond the traditional value of making sure people know where to go when visiting and being an ADA compliant solution, our design added value to the environment by serving as an artistic element. 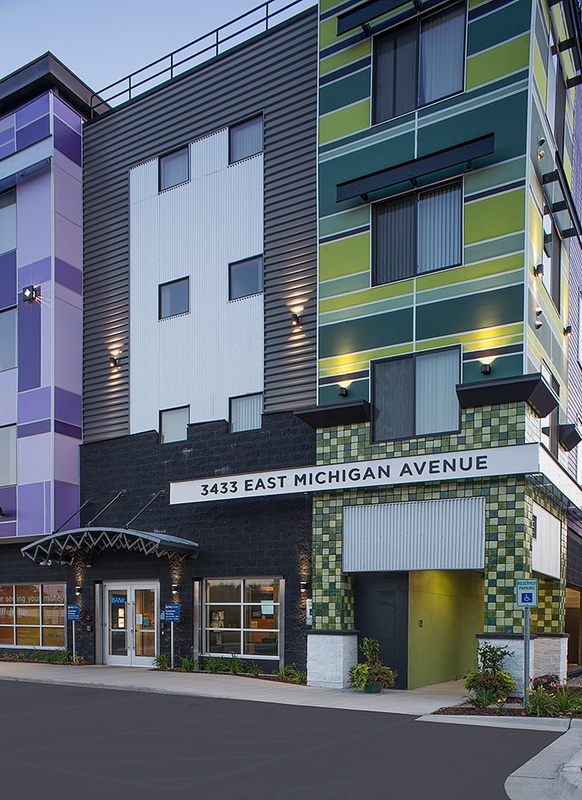 Our goal was that the custom signage and environment would make residents proud to live there and visitors want to live there.” Jon Moses, Ideation. If you find all the ADA compliance regulations a bit confusing, don’t worry. A professional sign company, like Ideation Signs, understands the rules and can help you order what you need. Not only can they create your ADA compliant wayfinding signs but they can install them. You won’t have to worry about installation regulations either. Keep in mind that with compliance you are making your space more accessible, increasing the likelihood of visitors. 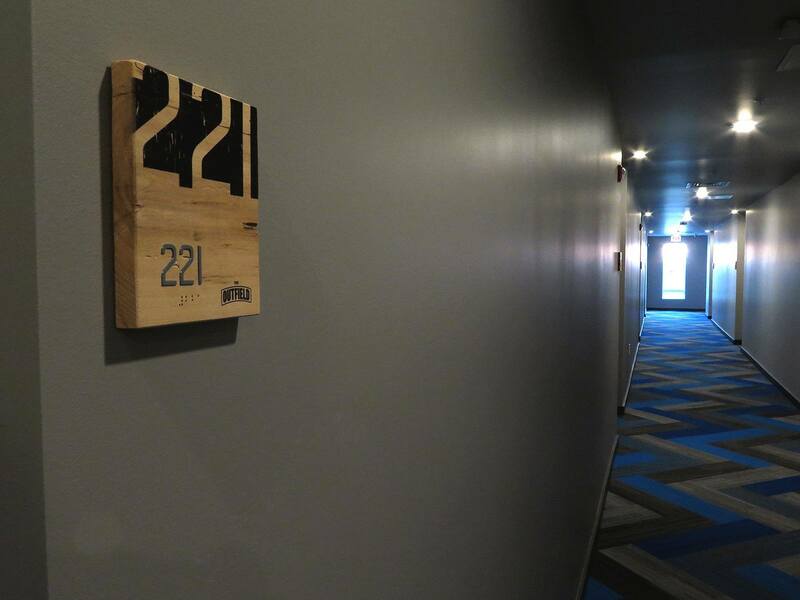 Gillespie Group, a developer of creative apartment communities and commercial spaces contacted us to design, produce and install custom ADA wayfinding signage that would work with commissioned graffiti art pieces and ultimately live up to the brand identity of their new Midtown apartment development in Lansing, Michigan. 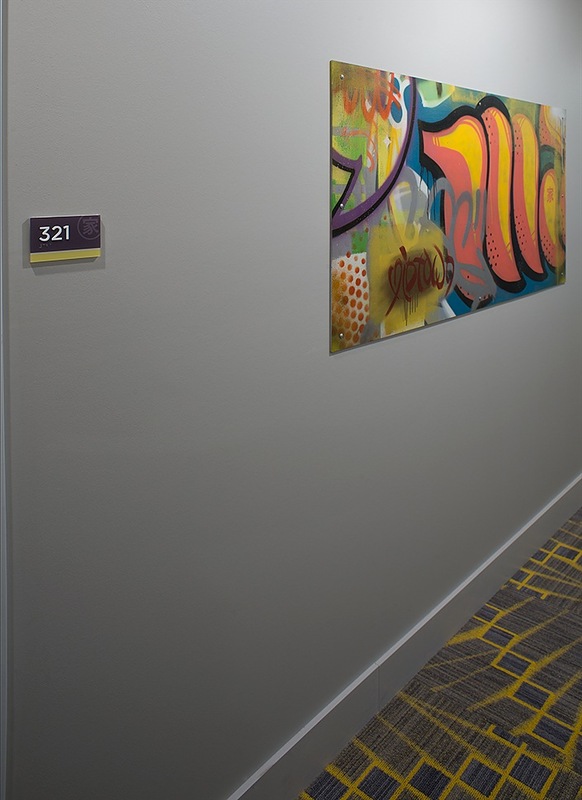 Large floor numbers made a statement while tying in with the floor-specific color palette and custom graffiti artwork. When we were brought in by the team at Gillespie Group, the target audience and brand identity for the property was already defined on paper. 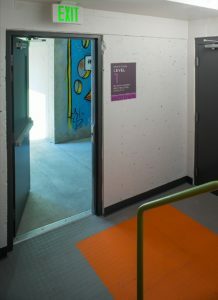 The architecture and interior design including color palette and finishes were already specified. Our goal was to come up with a wayfinding signage design that would work with these elements and contribute to the brand. Of course, we also needed to meet the budget and the required deadline. 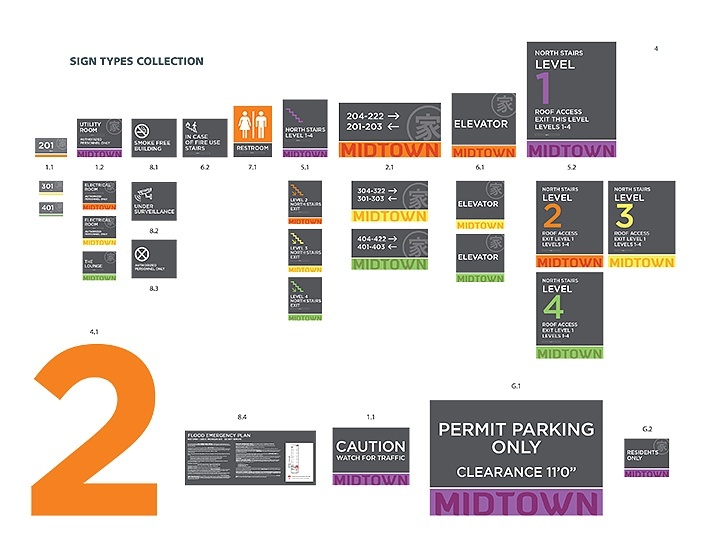 Sign Strategy: Survey and planning to determine the 132 signs from 16 unique types that would be needed in the space along with code and ADA compliance requirements. This also included a placement map of where signs would go. 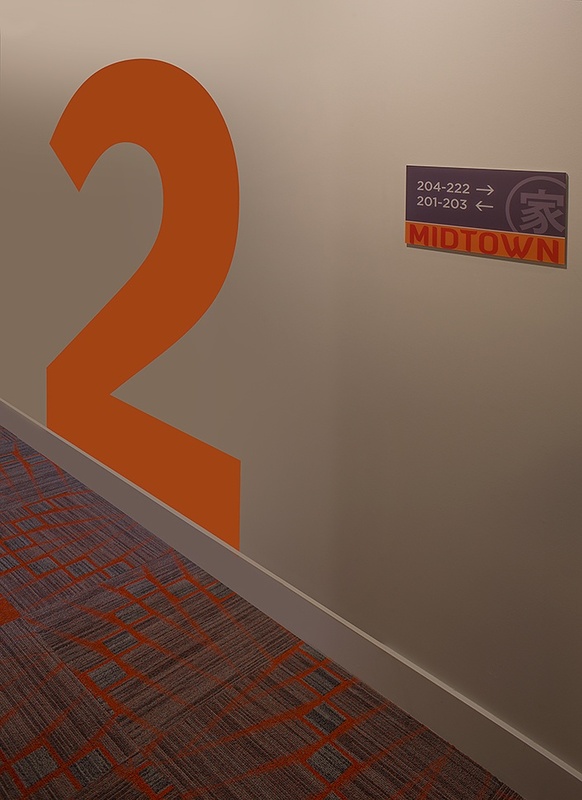 Directional wall signs greeted guests exiting the elevator on each floor. We designed the room identifications signs so they would meet ADA compliance regulations with tactile characters and grade 2 braille. 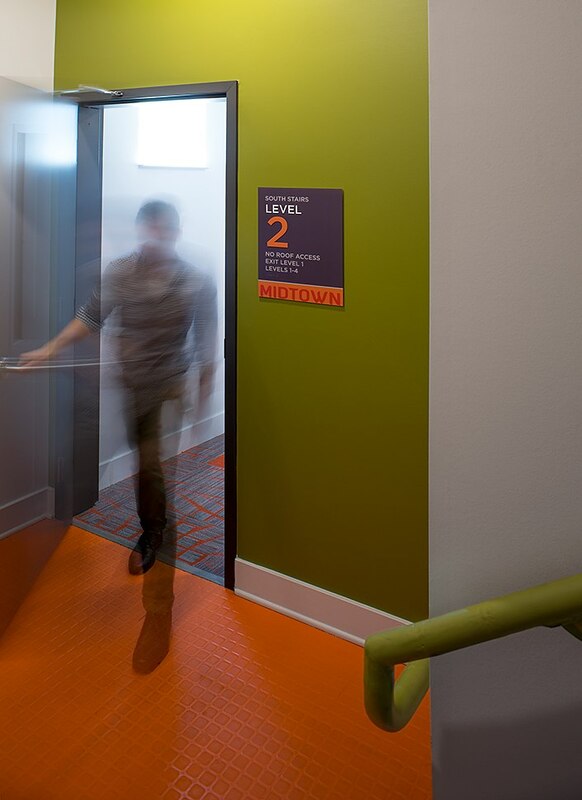 Code compliant stairway identification signs were designed with a floor-specific color palette that made both the client and the building inspector happy. 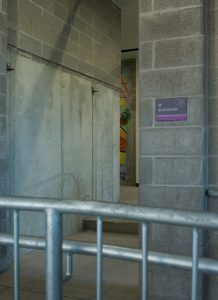 The sign system continued into the parking garage with a consistent design but unique materials to withstand the temperature drop. 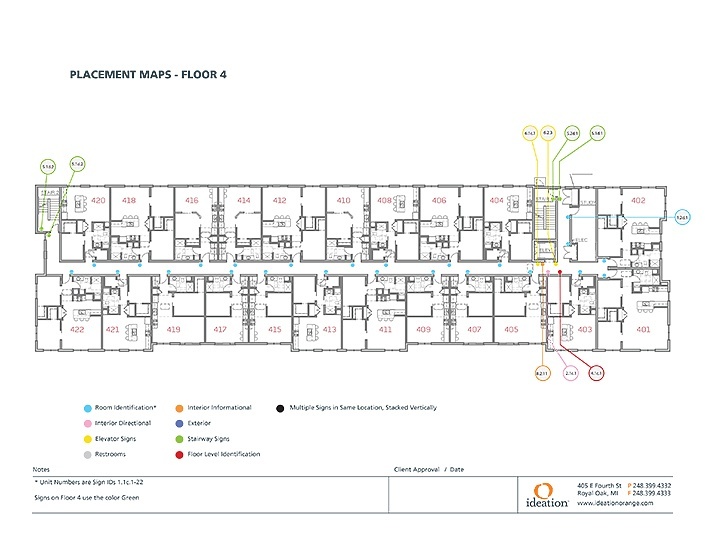 Our sign strategy included placement maps that worked to validate the need and placement of each sign with the client team, leading the way to a smooth installation. If you would like more information on ADA compliant signs, contact Ideation Signs & Communication. Ideation brands spaces and produces signs for businesses in the Detroit Metro Area. We’ll keep you on the cutting edge with fresh examples, new materials and best practices for space branding. ready to maximize the impact of your space? We’ll take the time to size up your opportunity. We’ll keep you on the cutting edge with fresh examples, new materials and best practices for place branding. serving royal oak, birmingham, ferndale, detroit, lansing, ann arbor, michigan and surrounding areas.